In today’s Etsy Era, in which everyone aspires to be an artisan (or at least shop like one), embroidery is an exotic handicraft, as incomprehensible to most consumers as blowing glass or brewing beer. But from the 16th century on, girls were schooled in the mysteries of needles and thread by creating samplers, which taught them simple stitches as well as their ABCs. By the end of the 19th century, the ways of embroidery were virtually encoded in every woman’s DNA. Coincidental to embroidery’s ubiquity were improvements in printing technologies, which spawned a proliferation of women’s magazines and catalogs published by thread companies, each packed with embroidery patterns for throw pillows, table runners, and decorative panels. Through embroidery, the first modern do-it-yourself movement was born. One of the most popular styles of this period, in the United States as well as in Europe, was Arts and Crafts, which represented a clean, modern look for those fed up with the fussiness of Victorian design or scandalized by the immodesty of Art Nouveau. 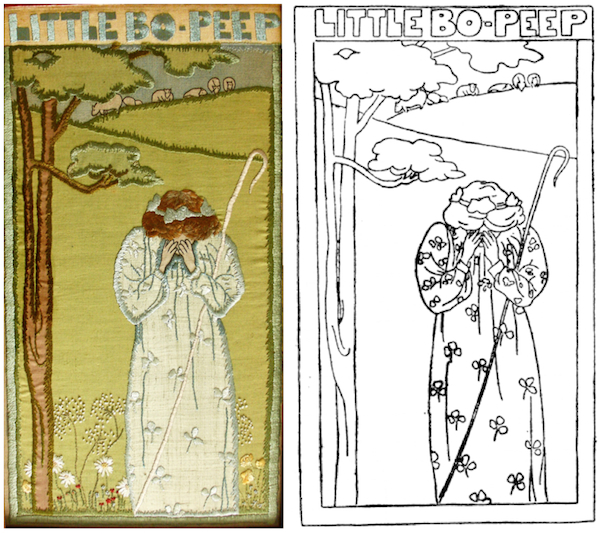 Top: An example of a particularly well-executed Little Bo-Peep embroidery, stitched from a design sold by London’s Liberty & Co. Above: Embroidery patterns were featured in thread-company catalogs such as these examples from the early 20th century. 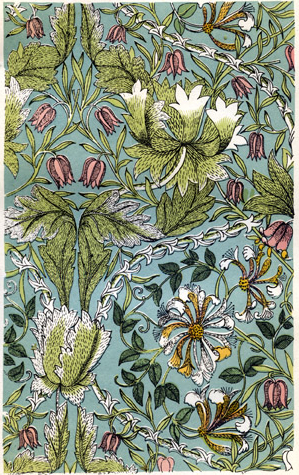 William Morris’s Honeysuckle pattern from 1876 was a favorite of his daughter May, who took over the embroidery department at Morris & Co. in 1885. Which is not to say Arts and Crafts embroidery was uninspired or halfhearted, as the designs of the father of Arts and Crafts in England, William Morris, his daughter May, and Morris designer Henry Dearle attest. Their intricate floral patterns in rainbow hues of silk floss set a high bar for the form, and generations of stitchers have struggled to replicate the ostensible simplicity and unrivaled quality of their work ever since. In fact, Stickley actively promoted Arts and Crafts embroidery in his short-lived, but highly influential, publication, “The Craftsmen,” often highlighting the work of other Arts and Crafts designers. For example, the August 1903 issue featured patterns for eight portieres (curtains designed to be hung in doorways that do not require actual wooden doors) by architects/designers Harvey Ellis and Claude Bragdon. But the real popularization of Arts and Crafts embroidery came from more mainstream sources, including women’s magazines such as “Modern Priscilla” (1887 – 1930) and “Home Needlework,” whose first issue dropped in 1899. 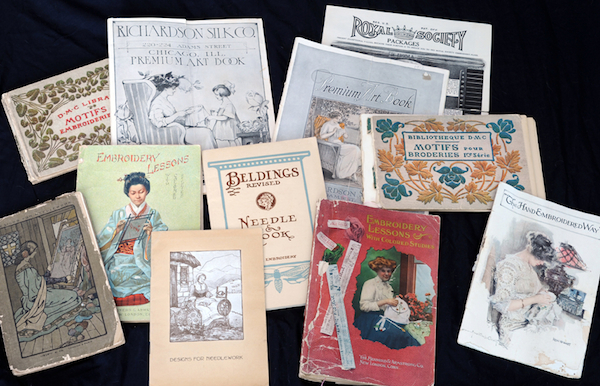 In these publications and others, patterns were typically bound into the magazine so that the reader could remove it and then embroider a throw pillow, napkin, or laundry bag at her leisure. Concurrently, American floss companies such as Nonotuck, Verran, and Belding published catalogs and kits for aspiring embroiderers, often packaging a stamped piece of fabric, various colors of silk or cotton, and sometimes even a needle for the convenience of their customers. While the patterns in publications were designed to sell magazines, the catalogs and kits were designed to move thread. Detail of a linen table runner, embroidered in silk, from Corticelli. While the Arts and Crafts movement may have evolved from lofty ideals such as “truth to material,” the people who ran thread companies understood marketing and branding, which is why, for example, Nonotuck Silk Co. of Northampton, Massachusetts, promoted a thread brand called Corticelli, to give the easily replicated commodity a romantic, Italian sensibility. Verran sold its thread and embroidery kits under the wealthy sounding Royal Society brand, even though its cotton thread and rayon floss, Euler writes, were less expensive than the silk floss sold by its competitors. As a point of reference, a typical Richardson Silk Company pattern, without the floss, cost 15 cents; selling thread was business of a lot of nickels and dimes, so differentiating your product in a marketplace where brand loyalty was largely absent was especially important. 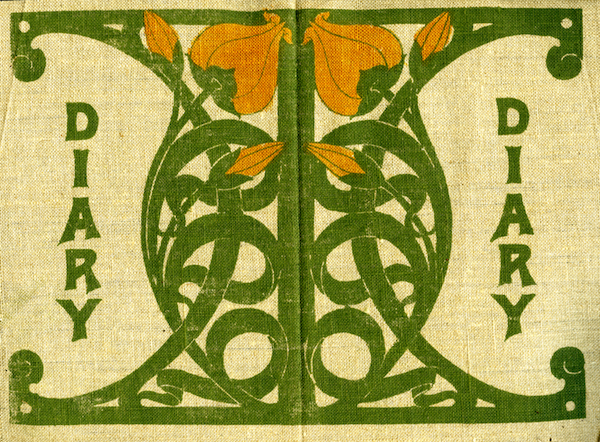 Royal Society patterns were often inspired by the Glasgow style of Arts and Crafts. Cleverly, or so it seems in retrospect, Royal Society promoted the Glasgow variant of Arts and Crafts favored by Scotsman Charles Rennie Mackintosh and American Frank Lloyd Wright, a sophisticated, somewhat minimalist aesthetic that was less detailed than a traditional William Morris design. It could be the powers that be at Verran simply liked Glasgow design, or they might have thought their customers would find the patterns more accessible than busier ones, but simpler designs required less thread, which may have helped Verran keep its costs to consumers low. Because so much Arts and Crafts embroidery was produced from kits by home embroiderers, whose training and skill varied greatly, vintage pieces on the market today are far from uniform. “People were expected to have a certain amount of knowledge about embroidery,” says Euler, “but many of the published patterns left a lot up to the person doing the work.” Although colors and stitches were often specified, she says, sometimes even that was left up to the embroiderer, as were more subtle details such as shading. 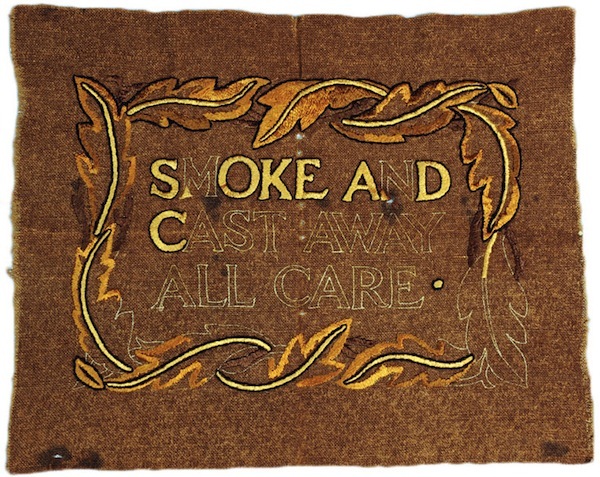 One of Euler’s favorite pieces in her book is this unfinished linen cushion cover, whose 1910’s embroiderer appears to have taken the slogan’s advice too much to heart. Thank you for the very interesting article! I hope you don’t mind my translation and posting it here: http://smilylana.blogspot.hu/2013/11/dawn-of-diy-when-it-was-hip-to-stitch.html with all references, of course. Thank you for this informative article. I live in a Craftsman bldg. and always looking for the right items for my apartment. It’s difficult to find original hand embroidered items. Thank you for this post (I was directed here from Root Simple). Aside from my general interest in Arts & Crafts stuff, I own a Royal Society embroidery floss display cabinet (I use it to display items from my British royal commemoratives collection!) and am glad to learn more about the company’s history. I would like to get the neddlework on this page. “ ” It sounds romantic, but I think it was a rather miserable existence for everyone.